Last week I wrote about how I don’t know how to be angry. A week later – no surprise – I still don’t. But I am more ready to learn now because my anger is leaking out (sorry TSA person I snapped at and young man I glowered at when you got into our shared Lyft) but also because I want to learn. I want anger to grow me. To help me take wise action to make the world safer for others with less privilege and choice and to help me not end up twisted, bitter, and mean. I’m a reader, so I always start learning by reading. First up are these two books I found through recommendations. I have not read them yet. I’m a meditator so I will seek to learn from anger this way. First I will be working with an approach from the beloved THICH NHAT HANH … “Mindfulness does not fight anger or despair. Mindfulness is there in order to recognize. To be mindful of something is to recognize that something is there in the present moment. Mindfulness is the capacity of being aware of what is going on in the present moment. “Breathing in, I know that anger has manifested in me; breathing out, I smile towards my anger.” Read his article here. I may only be able to do this for a few moments at a time right now, but I will aim for open curiosity. I will also be reflecting on this from Dr. John Makransky…”We need to go beyond the brittle self-centeredness of anger and take the power and energy that are driving anger and direct it at its truer objects. Instead of hating other persons as objects to be defeated or destroyed, we can let our wrathful energy target all patterns of greed, prejudice, hatred, fear, and self-protectiveness that have been operative in every one of us, starting with ourselves. To do this is to be given over to the underlying energy of impartial compassion in the nature of our minds. This energy can become ferocious in upholding everyone in their essential dignity and potential. …Ordinary anger is motivated by fear and aversion; wrathful compassion is motivated by love that has the courage to confront people for their own sake. Anger seeks to protect the self, or one’s own self-righteousness. Wrathful compassion seeks to protect all others, by challenging what harms them. The difference is quite clear.” Read the full interview and try the meditation practice he offers here. I’m a listener, so I invite you to comment here on how you’re learning or have learned to work with, be with, and bear anger, especially anger at injustice, racism, sexism, and all else that chafes and rankles your heart. I find it possible to agree with the differnce between anger fueled compassion for the need to defuse injustice and greed and all the lls of the world created by our fellow humans. I can even agree that anger is partly designed to protect ourseves. It is a perfectly normal reaction to being somehow hurt by circumstance or the actions of another. I think we have a lot to learn about dealing with it and with the consequences of the damage. But, smiling at it??? Hmmm, doesn’t seem enough somehow. I am seeking knowledge of how best can those hurt by injustice, greed, wrong doing or even chance get on with their lives? I know from experiience anger can chew you up inside, whatever it is a rection to. But, burying it can fester. Anger is energy that need to be released by taking action. But what action? I will be interested especially in your thoughts on how the recipients of injustice can best move on. I think Joann the approach Thich is taking is valid and then allows us to have more calmness to take those actions to make the world more just. That is how I took his advice in the article he wrote. from the Buddha: Let us remain free from hatred in the midst of people who hate. Jen I love your commentary on rage– some of my best most creatively successful ideas have come from anger. It’s a fuel like so many others. Thank you for calling it out and pointing the way! Thanks for the wonderful resource suggestions. Like Claire above, I find my anger fueling all kinds of writing. My “activist poetry” has been spewing forth. I’ve also started keeping a prayer journal. I begin with expressing gratitude for something–even something small. (Thank you for the ability to read and write….) Then I work my way into what I want help with. Writing provides the best salve on the days when my emotions are most tortured. Thank you so much for sharing this, Jen. I am with you on feeling my anger leaking and I hear it in other women’s voices and behavior every day. My most recent leak involved an internal struggle with what to do about a young man literally and figuratively taking up SO much space in a long Chipotle line. Really it’s an opportunity to go deeper into what is really going on. I think our anger is something disenfranchised groups within our society have experienced all their lives. AND. I’m sure there is a new way for women specifically to channel this anger, though we have no idea what that looks and feels like yet. First we acknowledge it’s there. I’m reading the Rage Becomes Her book you mentioned, not to get riled up, but to better understand, and like you, learn from and work with this emotion. I’m playing with ways we can gather to talk about this. The last thing we need is to feel what we feel and write it off, stuff it, turn to violence, etc like we have always done. Something new wants to emerge. The words you share around this are landing in our hearts in the ways we need. Thank you for writing. I oftentimes remember to ask myself “is this constructive or destructive?” and continue from there. Constructive anger (from love) moves forward, destructive anger (from fear or hate or targeting those who are either hold different opinions or don’t listen or care about what we value – a couple examples) shuts us or others down and is harmful. I’ve been working on my relationship with anger for about 15 years now. I used to deny it or automatically knee-jerk it to the negative (Julie, you’re NOT that!) pile. <—- that was meant tongue in cheek, me living up to my chronically Miss Nicey Nice self. I tend to turn toward those I would rather emulate – how did MLK respond with rage and anger? How did it show in him? How about Mother Theresa? What did Teresa of Avila behave when enraged? These are the avenues I take. Perhaps I’ll skim/choose to read the books you suggest. Would so enjoy mindful discussions of anger and rage rather than discussions that create more destructive anger and rage (which is so prevalent right now). I actually did a lot of anger work in therapy. And I went to a five-day retreat at Caron Family Foundations in PA which was pivotal. This was in the 90s I don’t know if they still do them. I believe that it is very important to lose yourself in anger, in a safe way, because it helps to realize where your core anger lies. I went into that workshop thinking I was angry at my parents and came out knowing it was anger at an abusive relationship with my then soon to be released husband. It was very freeing. 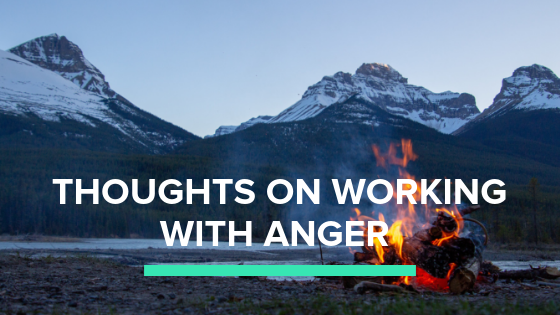 When you do anger work in a therapeutic environment, it can be very healing indeed. Sometimes you have to give yourself permission to be the patient. My family has taught me a couple lessons about living with & handling the perpetual, underlying anger that has been with me since late 2016 and only seems to get worse with the news. Thank you as ever for your thoughtful and thought-provoking content. You help me so much. I appreciate you opening the space for processing anger. My journey in the past few weeks has been processing why I’m not as angry as other woman. I’ve kept it to myself until now, because I’ve seen other woman getting reprimanded in some online spaces for not being angry enough. I’m learning to be comfortable in my own skin. And remember that in times of social change, everyone’s role is important. And although I take a quieter role, my subdued action is not a sign of complacency. It’s a celebration of who I am. And my way to share my gratitude for others who have paved the way to me to have the space and freedom to do so. This is an important topic for me as I’m trying, as you say, to keep my anger from leaking. I have decades of repressed anger that is bottled up for fear of being seen as a psycho. I “leak” my anger when I react to my perception of “idiot drivers!” But in the last year I’ve been working on keeping myself from reacting and telling myself to relax and slow down. I just ordered Rage Becomes Her because I immediately identified with crying when I’m angry and then battling depression. Why is it we women are never to show anger?!! Thanks, Jen, for opening this conversation. My views on anger are deeply influenced by the work of Karla McLaren. She describes anger as a response to a boundary violation. The strong energy of anger is there to support one in correcting that violation. Anger is a vital emotion that helps keep us safe. We just need to learn to direct it in healthy ways. I’ve been working on rediscovering my anger (it’s been tucked out of sight for a long time) and have found that screaming and raging when I’m alone in my car has been helpful and surprisingly satisfying! I can unload some of my excess anger safely away from others, then I feel like I can deal with the smaller issues more appropriately (without exploding all over some unsuspecting soul). Hi Jen, Another way of looking at anger is that it is simply energy. In it’s most primitive form that energy is used to get a problem solved. (Think an infant who screams until the right kind of comfort arrives.) This perspective allows us to look at how to use the angry energy to make the desired change. In my experience, using angry energy in a focused way often creates the change we are looking for and dissipates the energy we call anger. I wrote about this in a 30-year-old book called Recovery From Co-Dependency: It’s Never Too Late to Reclaim Your Childhood. which is still available. Most helpful book for me was The Dance of Anger, by Harriet Lerner. (And all her other books, closely related.) But in couples therapy, long, long ago, with our beloved therapist-translator, Don Dubin, I remember the epiphany of going below the anger. Don would ask, “What else are you feeling?” And always, there is more than the surface covering of stormy anger. Usually below, sometimes at great depth, I found and felt hurt. Allowing the sad feelings to bubble up pushes anger away, no longer useful for trying to hide what we don’t want to know we feel, and sometimes aren’t able to feel. When you see and feel the hurt, understanding follows. Then actions can be helpful, not reactive and defensive.